Charles is a very outgoing, committed & well spoken young professional. His experience includes the design of 60 + websites along with many other technical certifications. Charles also has experience in marketing, project management & logistics in the commercial & hospitality industry's. In 2011, Charles founded Intraglo Technologies Corp, a Jacksonville based hospitality sales and IT firm committed to providing the best products and service at a affordable price. The firm specializes in ADA compliant products along with photography, web design, seo, and digital & social media. 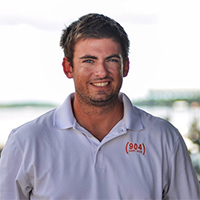 In early 2012, Charles founded 904 Happy Hour Corporation. 904 Happy Hour is a local website directory for people trying to find events, restaurant specials and photos. In just under a year, the website has grown to be the most popular online directory in the area. 2013 had been a big year for Charles. In June, his company 904 Happy Hour hit 20,000 likes on Facebook, a milestone for the entertainment website which has continued to grow. In July, Charles was nominated as a Top 30 Under 30 for Future Business Leaders In Jacksonville by Buzz Magazine, a monthly local magazine. Jacksonville National Cemetery Volunteers Are Placing Thousands Of American Flags On Graves For The Memorial Day Observance.